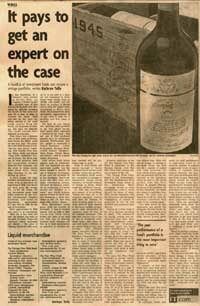 In late September, at a Christie's wine auction in Beverly Hills, Los Angeles, a bidder bought a 12-bottle case of rare Mouton-Rothschild 1945 Bordeaux for $290,000, breaking the record for the most ever paid for a case of wine at auction by more than $100,000. In the next lot, before anyone in the room could recover from the shock, six magnums of Mouton 1945 went for $345,000. Two world records were smashed in minutes. Fine wines had a bumper year in 2006. Sales at US auctions broke the $200m mark for the first time. The promise of the 2005 Bordeaux harvest has sent prices rocketing. New buyers from Russia, China, India and Korea vying with traditional buyers to obtain the finite supply of wine produced from the exceptional vintages from the best chateaux, and the trend to drink investment grade wine, rather than hoarding it, are also driving up prices. If you'd bought the right portfolio of investment grade wines, even as late as at the beginning of 2006, you would not have gone far wrong. The Liv-Ex 100 Index, the key investment grade wine index produced by the London International Vintners Exchange, now listed on Bloomberg, appreciated 45.7 per cent in 2006 by the end of November. Price appreciation in 2006 may prove to be exceptional - after all, it has been the best the market has seen in the past 10 years. Prices are relatively stable (although not always - the price of Chateau Montrose 2003 went up by 50 per cent in a day), are not correlated to traditional asset classes such as stocks and bonds and are likely to produce a decent return over the longer-term. According to Berry Bros Rudd, the international wine merchants, appreciation of 15 per cent a year on a portfolio over five years is realistic. Yet how do you obtain that optimum wine portfolio in the first place? Investment grade wines represent a fraction of the total - 99.9 per cent of that produced globally have no investment potential. Furthermore, that tiny market is restricted to French Bordeaux - Lafite Rothschild, Mouton Rothschild, Latour, Margaux, Haut Brion, Cheval Blanc and Petrus - and to a lesser extent, Burgundy. Fine wines from other regions such as California, Italy and Australia can also appreciate rapidly but the resale market is limited. "If one is doing an investment, 80 per cent will probably be in fine Bordeaux. That's not to say that other wines can't make outstanding returns, but more Bordeaux is available in production, it's better known and sturdier as a wine, " says David Roberts, master of wine at David Roberts Domaines, a niche merchant in the UK that only deals with private clients. Wine investment looks great with the benefit of hindsight. A case of Chateau Latour sold in 1990 at $800 would now fetch about $7,050, but there is no hard and fast way of proving whether feted vintages will live up to their expectations at maturity, or whether the next harvest will be anywhere near as good. Even if individuals are smart enough or lucky enough to have several cases of some recent star performers, investment grade wines are susceptible to damage or temperature change during shipment across the Atlantic or storage at home, which could put off future buyers. As with any collectible, provenance is everything. Taking the wine out of its original stamped wooden case from the chateau, let alone drinking some, is even more perilous than moving it. Buyers at auction are generally only interested in complete cases of wine in the original container. "The idea that you can buy a case or two of wonderful wine, drink some, offer some for sale and make a fortune on the whole thing is very misleading, " says Richard Bakal, executive director of The Wine Trust, based in Richfield, Connecticut. There is a potential solution to some of these problems. A handful of specific wine investment funds exist, where clients make a minimum investment in the portfolio of wines chosen by specialist assets managers. The managers of the fund will choose the portfolio of wines and store them in a temperature controlled warehouse. In return, they charge a management fee and sometimes a performance fee, too. Some boast impressive results. The Vintage Fine Wine Fund saw a return of 23.5 per cent to the end of November in 2006 and 48.9 per cent since its inception three years ago. Another, The Fine Wine Fund, was only launched at the end of August, yet was up 6.1 per cent by the end of November (see box below). However, none exist in the US. The Vintage Fine Wine Fund is registered in the Cayman Islands, while The Fine Wine fund, among others, is based in the UK. The Orange Wine Fund, based in the Netherlands, and The International Wine Investment Fund, listed on the Australian Stock Exchange, invest in wine companies, rather than directly in cases of wine. They are not registered with the Securities and Exchange Commission, so cannot be marketed in the US, but investors can approach them directly. Setting up a wine fund in the US is onerous, according to Bakal. "The regulations on buying, owning and distributing wine here have been extraordinarily complicated and irrational, although there has been some liberalisation in the last couple of years, " he says. But that could soon change, given the high interest from US investors in the market. Bakal also plans to launch the first US wine investment fund, which he believes could work in spite of the regulatory constraints. For now, The Wine Trust manages a private family collection of Bordeaux. Wines are purchased directly from the chateaux en primeur, which is a type of wine future. Wine is bought when it is released by the chateau the summer after the harvest, but before it is bottled. It is received by the buyer in another 18 months. The Wine Trust cellars the wine for 10 or 15 years and then sells it to high-end retailers and restaurants, such as Daniel and 21 Club in New York. The new private fund will work somewhat like a venture capital fund. Wine will still be bought en primeur at wholesale prices, the fund will do a number of capital calls from investors, the wine will be held to maturity and the proceeds will be distributed to the investors, either in cash or the actual bottles. Like The Wine Trust's H present offering, the focus of the portfolio will be fine Bordeaux, but Bakal also wants to introduce Burgundy. He adds that he wants to avoid the hefty fee structure associated with some of the existing funds. "I've been struck by how aggressive and greedy the managers of some funds can be. We are not going to overstretch management fees. " What should private investors look out for - apart from the fee structure - if they choose to investigate the overseas specialist funds themselves? A number of fine wine funds have gone bust and it is an unregulated industry. Roberts says would-be investors should consider the manager's knowledge of the market and the relationships the fund has with the top chateaux. Bakal also says that there can be a conflict of interest if the fund managers are buying and selling wine for their own account, as well as for clients. In addition, funds that quote the past performance of individual wines in a selective manner to suggest exaggerated levels of appreciation, or construct wine indices showing the market's past performance retrospectively around these high points, should be avoided. While certain wines have appreciated dramatically, that is not much good if the fund does not own them or if those it does own are duds. The past performance of a fund's entire portfolio is the most important thing to note. "You see specialist magazines write about the appreciation of certain wines, " says Bakal. "What they don't tell you is whether you would have been able to get your hands on this in the first place, if so, how much would you have got and what sort of condition it would have been in. " There is another consideration. Many funds buy in the secondary market, but the funds that also buy wine futures (en primeur) are no longer getting bargains. Chateaux have wised up to the increased number of buyers after their wares. The much-hyped 2005 Bordeaux vintage is being sold for very steep prices en primeur. Sooner or later, Bakal fears that opening prices will become so high that there will be no future profit for other investors. "I've been hearing for 25 years that I'll get in trouble in this market and it hasn't happened yet, but sooner or later, investors will get burnt. " Investment objective: high-capital appreciation by investing in fine wines from regions including Bordeaux, Burgundy, The Rhone Valley, Tuscany, Piedmont, Champagne and Portugal.